Lisburn man Eric Bowyer (right) with his Linfield Football Club Life Membership ticket presented to him at Windsor Park on Saturday by Linfield Chairman Jim Kerr. Peter Rafferty, left, another iconic Linfield player, also received Life Membership status. Eric, who lives off the Belsize Road, was Linfield captain in the 1960s and 1970s and manager in the early 1990s. 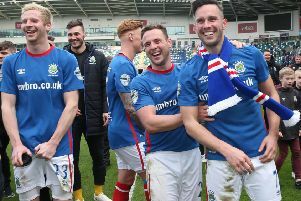 Lisburn man Eric Bowyer said it was a ‘great privilege’ to be honoured by Linfield FC last weekend, when he was granted honorary life membership. Linfield stalwarts, Eric, and former Distillery player Peter Rafferty, were both honoured before the Blues’ match last Saturday. The highly popular former club captains and stalwart players were granted honorary life membership in recognition of their outstanding services in a Blue jersey. Eric said he was ‘very excited’ by the news when he discovered he was to be honoured by the club. Eric still keeps in touch with former team mates at the club, and he will go along to matches now and then to keep an eye on the club’s current stars. Speaking about the presentation, he commented: “There was a presentation before the match in the boardroom and then Peter and I were brought out onto the pitch before the start of the game, where we were introduced to the crowd. “I have to say, I find that more difficult, as I suspect many don’t know who I am, they are only young bucks. “I was glad to be in Peter’s company,” Eric added. Eric, who lives off the Belsize Road in Lisburn, was joined at the presentation by his son-in-law and his young grandson, who was excited to meet the players. Eric, who was Linfield manager for several years in the early 1990s, made his Linfield debut against Cliftonville on September 16, 1967 and captained the Blues between 1968 and 1972. He won an Irish Cup winners’ medal v Ballymena United in 1970; two Irish League medals in 1970-71 and 1974-75; a Co Antrim Shield medal in 1973; two Gold Cup medals in 1968/69 and 1970/71; two Ulster Cup medals in 1970/71 and 1971/72 and a Blaxnit All-Ireland Cup medal in 1970/71. He also won two Inter-League caps against the League of Ireland in 1969-70 and against the English League in 1970-71 and was chosen Ulster ‘Footballer of the Year’ in 1975. In all, Eric played in 380 Linfield appearances, including 10 European games. He was Linfield manager from May 1990 to October 1992. His other clubs as a player were Bangor, Glenavon and Carrick Rangers. Peter Rafferty was a Northern Ireland international who played against England at Windsor Park in 1979. Nicknamed the ‘Bald Eagle’ by the Linfield supporters, he made 331 appearances in nine seasons for the Blues, winning five Irish League titles, three Irish Cups, one City Cup, two Gold Cups, four Ulster Cups, three Co Antrim Shields and one Tyler All-Ireland Cup. He was the Ulster ‘Footballer of the Year’ for 1976-77. Peter also played with Distillery, Ards and Crusaders in the 1960s, 1970s and 1980s. He also won two caps inter-league caps. Peter made his Irish League debut in April 1967 for Distillery as a centre-forward, but established himself the following season as a centre-half. He won an Irish Cup winners’ medal with the Whites in 1971. In total he made 262 Distillery appearances.